Everyone has unique way to look at ‘problem’. When it comes to Problem solving. The first step is to understand problem. Most of us fail at this particular step. Depending upon nature of problem, we should look at problem from various facets (viewpoints). Then, collect necessary information by separating facts from assumptions and perspectives. Finally, putting everything together in the way that helps to formulate solutions. 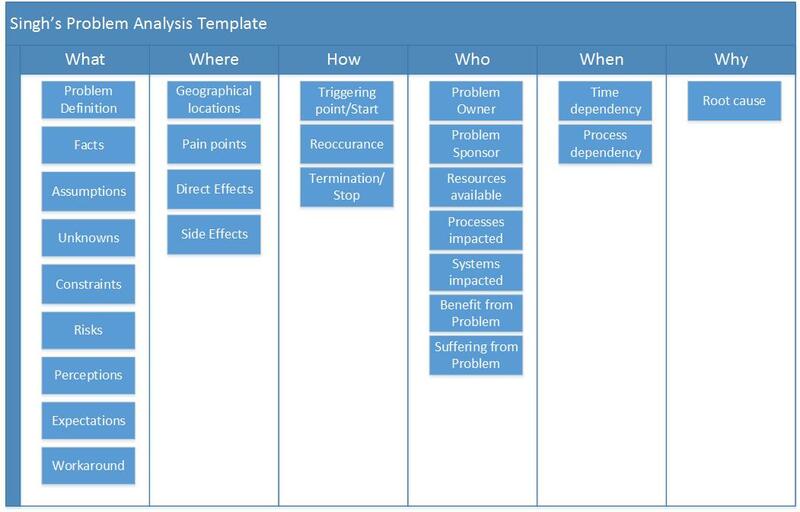 You will get a lot of value by brainstorming complex problems using this template. Remember, template helps you to analyse problem. So, put your quick solution thoughts aside and focus on understanding problem. Which tools have you used in past? Try out this template and let me know your thoughts! Thanks for sharing. This is a good way to understand a business and do a business write up too.